The Italian establishment depicts the upcoming election as a struggle between pro- and anti-Europeans. However, none of the major parties seriously question Italy’s euro and EU membership. A struggle between Europeanists and sovereignists? With a general election just a few days away on March 4, all eyes are – once again – on the Belpaese. Among the EU’s major countries, Italy has long been considered the weakest link. Each Italian election – marked by threats of post-electoral political instability – simply reinforces this perception. This one is no different: amidst surging ‘populism’, widespread euroscepticism and growing anti-immigrant (and neo-Fascist?) sentiments, the upcoming elections are seen by many as a serious “political risk” to the stability of the European Union, as Pierre Moscovici, the EU’s economic affairs commissioner, recently stated. However, these fears are largely overblown. ‘Europe’ has become a crucial political fault line – one which pits pro-Europeans/integrationists against eurosceptics and anti-integrationists. Are such alarmist tones – and daring historical parallels – justified? There is no doubt that in recent years, in Italy as elsewhere, ‘Europe’ has become a crucial political fault line – one which pits pro-Europeans/integrationists against eurosceptics and anti-integrationists – progressively supplanting the traditional left-right divide. In Italy, the first bloc is led by the Democratic Party. Though formally a centre-left party (at the European level it is a member of the Party of European Socialists), in recent years the PD has established itself as a neoliberal-centrist party. For these elections it has brought on board many former members of centre-right parties (most notably Pier Ferdinando Casini, for years the de facto leader of the Union of Christian and Centre Democrats) – whose identity is first and foremost fashioned by its unwavering commitment to ‘Europe’ (much like Emmanuelle Macron’s La République en marche! ), in opposition to the ‘populist’ eurosceptics. This continues a long-standing tradition of the Italian post-communist (centre-)left, which from the early 1990s onwards embraced Maastricht and the (neo)liberalisation of the Italian economy with unparalleled enthusiasm, partly to amend for its perceived sins of the past. In recent months, the PD has upped its Europeanist rhetoric. 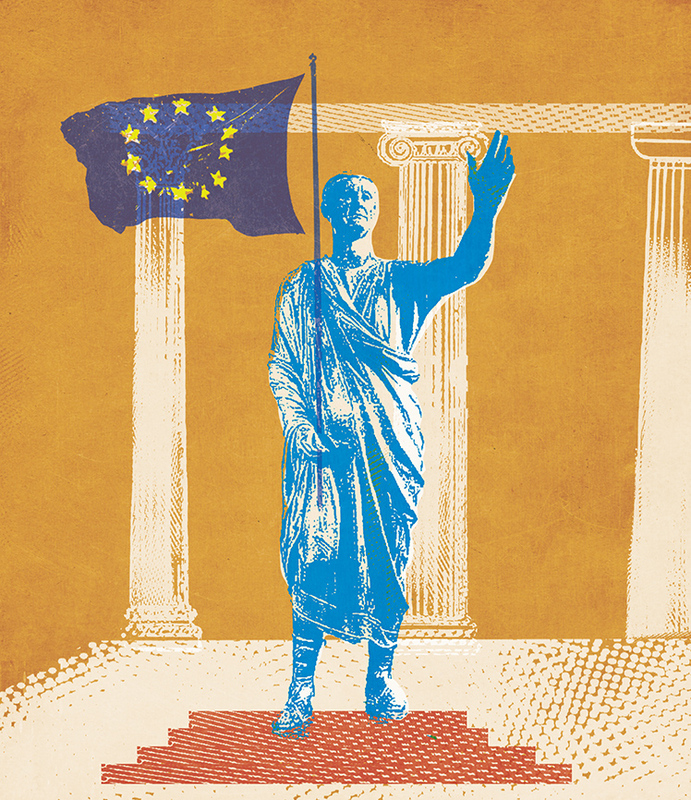 Following the example of Macron in France and Martin Schulz in Germany (and, rumours have it, Fabbrini’s advice), former prime minister and current PD secretary Matteo Renzi has adopted a fully-fledged euro-federalist vision. “The future”, Renzi proclaimed at the outset of the electoral campaign, “is called United States of Europe”. As one may expect, the party’s electoral programme reflects the usual jumble of pro-integrationist measures. Curiously, the document proposes a “common [European] budget to deal with economic shocks” to be financed with the issuance of Eurobonds for up to 5 per cent of the Eurozone’s gross domestic product as well as “the creation of a European Monetary Fund that can offer financial assistance [to Member States] in exceptional circumstances”. This is somewhat contradictory: if the former existed, the latter would not be needed. We can only conclude that the PD is perfectly aware that a ‘normal’ European-level federal budget – i.e., one in which the Eurozone itself could run budget deficits with European Central Bank support and engage in unconditional fiscal transfers to countries in need, as occurs in all ‘normal’ federations – is a not on the table. It isn’t, as confirmed by the latest news coming out of Germany, and the PD is therefore ready to acquiesce to the Franco-German (and the European Commission’s) consensus on the way forward for Europe. Despite differing views on minor details, France and Germany (and the Commission) essentially agree on further curbing what little sovereignty and autonomy Member States have left, particularly in the area of fiscal policy, in exchange for the creation of an institution – the aforementioned European Monetary Fund (EMF) – tasked providing financial assistance to countries in need. This assistance would be conditional on neoliberal ‘structural reforms’ and possibly even debt restructuring (there is disagreement over exactly how much power the EMF should have, and who exactly should control it). Whatever the outcome of these discussions, however, for high-debt countries such as Italy the new arrangement would amount to an even tighter deflationary straightjacket than the current one. As noted by Simon Wren-Lewis, the political conflict of interest implied by having such an institution lending within the Eurozone would almost certainly end up imposing severe austerity on the recovering country. The PD essentially sees it as its role to manage, rather than to challenge, Italy’s subordinated role within the dominant hierarchy of power in Europe. Furthermore, the PD’s programme talks of “overcoming the Fiscal Compact” – the Italian Parliament recently voted against incorporating it in the European treaties – but also promises to “reduce Italy’s debt-to-GDP ratio … through structural reforms and primary budget surpluses”. In other words, to continue along the same self-destructive path that the country has been pursuing for years. Ultimately, it could be said that the PD essentially sees it as its role to manage, rather than to challenge, Italy’s subordinated role within the dominant hierarchy of power in Europe. On this point, it is worth noting that the PD is running in a coalition with the straightforwardly-named More Europe, led by Emma Bonino, leader of the Italian Radicals. As the name suggests, it is a strongly pro-European party that essentially advocates a self-imposed (or possibly even imposed from outside) über-liberal, troika-style programme for Italy, including a tightening of the Fiscal Compact rules, a freezing of public spending for five years and a further lowering of corporate taxes. In addition to the PD, the pro-European bloc also includes: the new centre-left party Free and Equal, an offshoot of the PD; various Christian-democrats, such as the aforementioned Casini; the former secretary of Silvio Berlusconi’s centre-right party The People of Freedom, Angelino Alfano; and the current president of the European Parliament and former member of Berlusconi’s party Forza Italia, Antonio Tajani. Berlusconi – and the Italian centre-right more in general – have never fully broken with the pro-Eurozone consensus. However, since signing the coalition pact with Berlusconi a few months ago, Salvini has significantly softened his line on Europe. In January, Berlusconi tweeted that Salvini understood that leaving the euro would be “technically impossible and unsustainable for the Italian economy”. A quick look at the coalition’s ‘programme’ would appear to confirm this: the chapter on Europe simply states that the coalition stands for “a revision of the European treaties”, “a reduction of the surplus of Italy’s annual payments to the EU budget” and “the primacy of Italian law over Community law”. Quite a departure from the fiery tones of Basta euro. Furthermore, even though Salvini has often railed against Maastricht’s three per cent deficit-to-GDP limit, Berlusconi has also said that he will “respect the three per cent rule”. However, things are not that clear cut. Borghi, who is still the Northern League’s economic advisor, recently stated that “one second after the League is in government, it will begin all possible preparations to arrive at our monetary sovereignty”. The party has also recently brought on board Italy’s most famous anti-euro economist, and self-proclaimed leftist, Alberto Bagnai: a testament to the blurring of the right-left divide. The Five Star Movement has undergone a radical normalisation, particularly with regards to Europe and the euro. Italy’s ‘anti-establishment’ party par excellence, the Five Star Movement, which currently leads in the polls, has undergone a similar makeover to that of the Northern League. From its foundation, one of the party’s flagship policies was to revert back to the lira, to recover Italy’s ‘economic sovereignty’. The movement has long said that, when in power, it would hold a referendum on whether Italy should stay in the single currency. However, over the course of the past year and a half, the Five Star Movement has undergone a radical normalisation, particularly with regards to Europe and the euro. The first sign of this change of course came in January 2017, when the party, a long-time member of the right-wing eurosceptic Europe of Freedom and Direct Democracy group in the European Parliament, tried to join none other than Guy Verhofstadt’s strongly pro-EU Alliance of Liberals and Democrats for Europe group, though it was ultimately rebuffed. Then, in September 2017, Luigi Di Maio, the movement’s prime ministerial candidate, reassured industrialists at the Cernobbio business forum that he did not want an “extremist, populist, anti-European” government, and that he considered the referendum a “last resort” in case the Eurozone failed to reform. Finally, on January 9, Di Maio stated “I believe it is no longer the right moment for Italy to leave the euro”, claiming that Eurozone rules should change but that the party is no longer backing an exit from the single currency. This is reflected in the party’s electoral programme, which makes no reference to the EU or Eurozone. The chapter on ‘European constraints’ simply reads: “Budgetary policies can no longer be subject to non-scientific limits such as the 3 per cent deficit-to-GDP limit, which inhibit productive public investments and industrial policy”. The party, which clearly hasn’t learned the right lessons from SYRIZA’s parable, is also calling for a restructuring of Italy’s debt. This means that the elections’ most likely outcome will be… more of the same. As this overview of the main competing parties’ programmes and public statements makes clear, the establishment’s attempt to depict the coming elections as a struggle between pro- and anti-Europeans, between integrationists and sovereignists, is a façade. In fact, none of the major parties seriously question Italy’s euro and EU membership. This means that the elections’ most likely outcome will be… more of the same. Especially if we consider that the probable lack of a clear post-election majority is likely to result in the formation of yet another grand coalition or technical government. This, if anything, is the real anomaly, in a country whose economy and social fabric have been severely damaged by the single currency, as acknowledged even by Nobel laureate Joseph Stiglitz and by former German vice-minister for finance Heiner Flassbeck, and where euroscepticism relentlessly continues to grow, despite (or, arguably, because of) the main parties’ refusal to confront the issue.